the secretary - KVK SULTANPUR U.p. Born in 1957 Sri Vinod Singh S/o Late Sri K.N. Singh has developed his leadership capacity from student life while studying in University of Delhi, from where he got his Bachelor Degree in Arts and Master Degree in Political Science in the year 1980. He pursued his Bachelor degree in Law from Dr. Ram Manohar Lohia University, Faizabad in the year 1980. He started his career as a Law practicener at Allahabad High Court as a junior of the then Advocate General Sri S. S. Bhatnagar. Along with his active participation as Law practicener he got himself deeply involved as a youth Congress worker during nineties. However, on account of premature death of the founder Sri K.N. Singh, he had no option except to take the reigns as Secretary of the Kamla Nehru Memorial Trust and as Manager of all the Institutions run by it along with his social and political responsibility for the welfare of the people of Sultanpur District and now at state level as a Minister in the U.P. Government. It is his dynamic and vibrant leadership on account of which he was elected as M.L.A. 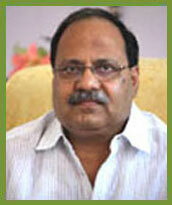 on May 11 2007 and on May 13, 2007 he was inducted as Minister of State (Independent Charge) Tourism in the U.P. Government.